In 2005 I was hired to make a French writing table or desk commonly referred to as a bureau plat. These desks vary greatly in their level of ornament but they usually have a tooled leather top with two leather lined slides on the left and right sides of the piece. They also generally have a wide center drawer with smaller flanking drawers (sometime two and sometimes four). Some have turned legs and some are tapered like this one. My client wanted a fairly restrained one but even so, I did add some bronze belts and brass moldings. It's made of mahogany and mahogany crotch veneers with quarter sawn oak for secondary wood. All the joinery was traditional hand cut dovetails and mortise and tenon where appropriate. I added a few secret compartments for fun. Despite the apparent simplicity of the piece there are a lot of internal parts that need to slide past each other. I've always liked this piece and would love to make some other versions of it someday. I don't have many photos but I have a few and I'm sorry that they were shot on standard film so the quality is less than ideal. I'll include comments with the images. This is the right side rail. The oak is veneered with the crotch mahogany but it hasn't been framed with solid mahogany yet. 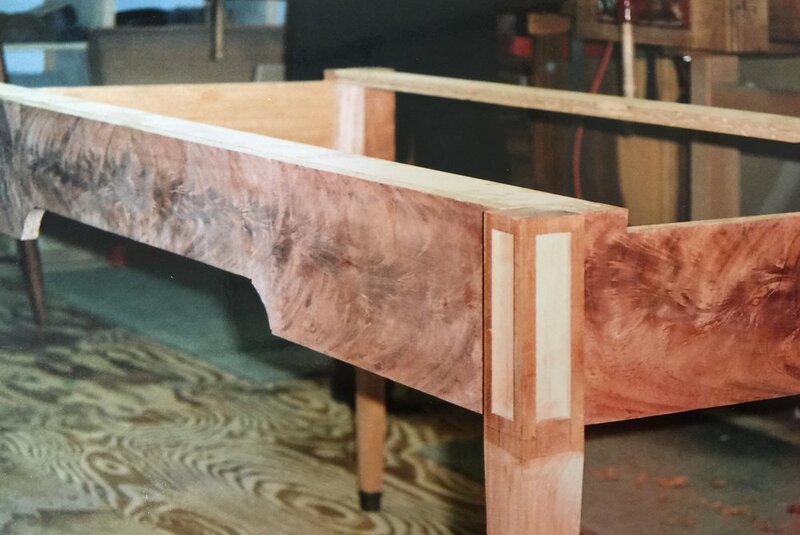 It shows the front tenon (to join the leg) and the doubler on the inside that allows for the joinery of the front horizontal framing elements. The same rail from the other side partially fit together. There are two mortises below and pins cut for two dovetails above. 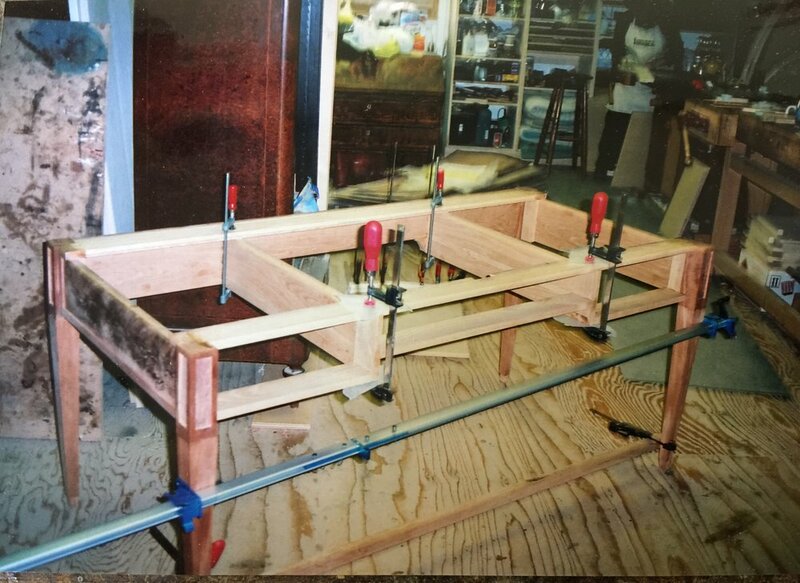 The rail and leg assembly with the solid mahogany framing bits being applied. This is a view of the back rail before being framed with mahogany. The crotch figure is book matched so that the "feather" points left and right. A detail of the glue up. The piece assembled like a puzzle. 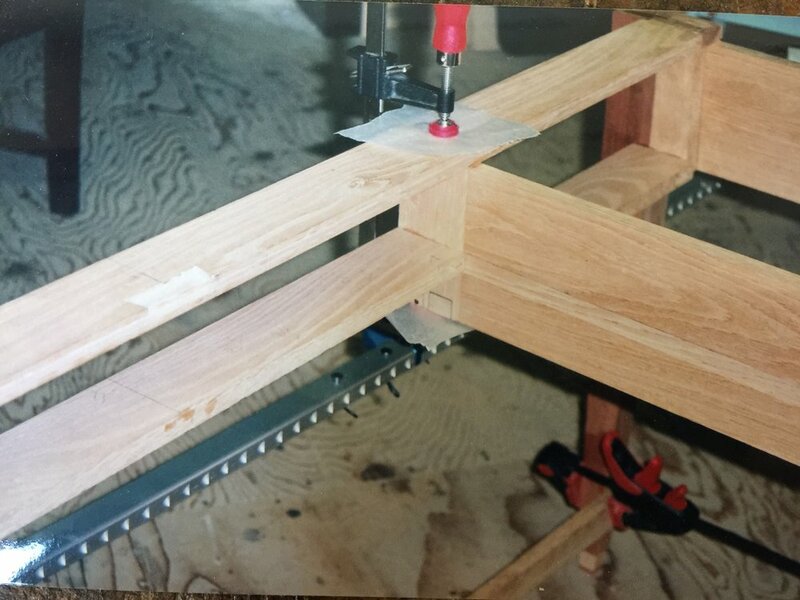 The clamp with the red handle is pulling a dovetail joint below closed while pulling a twin tenon above closed. A view of the slides extended without the top on. The frames have small tongues that slide in grooves of the oak horizontal rails. False back folds down to reveal two figured mahogany drawers. They were eventually French polished and fitted with nice pulls. Another view of the assembly. I dovetailed the box holding the smaller drawers. 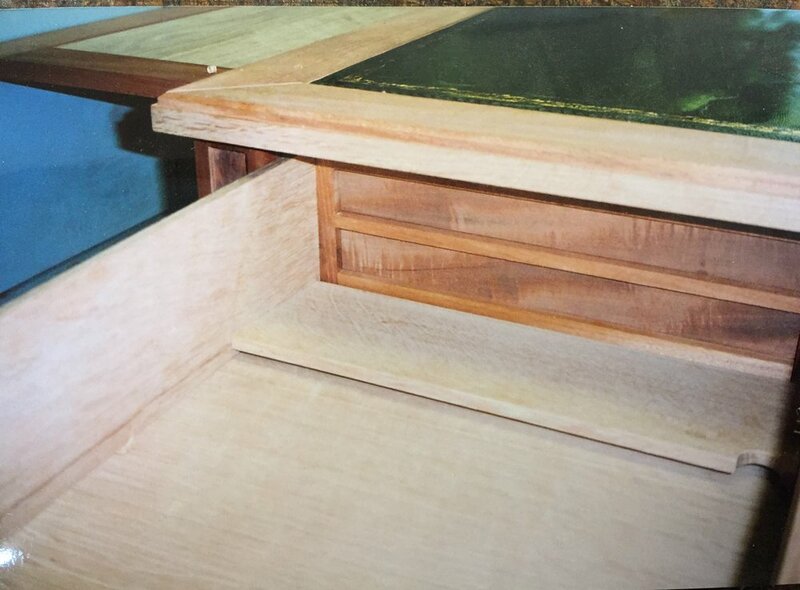 The left hand slide was extended so that you can see the mahogany box and drawers. The tops of the twin tenon are also visible and you can see how various elements need to slide past each other at right angles. A detail view of the finished piece. 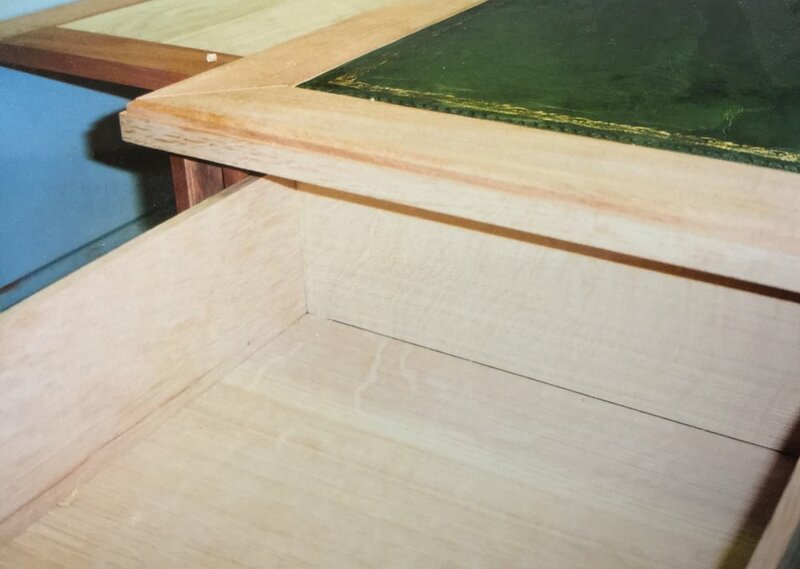 The leather lined surface on the right drawer slides back for access to the drawer below.